As a corporate tech designer and internet consultant, Paul Jarvis spent years working with professional athletes like Warren Sapp, Steve Nash and Shaquille O’Neal with their online presence, and with large companies like Yahoo, Microsoft, Mercedes-Benz and Warner Music. He then migrated to working with online entrepreneurs like Marie Forleo, Danielle LaPorte, and Kris Carr to help build their brands. Since becoming a company of one, he spends his time writing, podcasting, and creating online courses for more than 10,000 students. He lives with his wife on an island off the coast of Vancouver. "Paul Jarvis beautifully illustrates that “Small is the new big.” It's true. It's not about how many employees you have (or how many customers you serve). It is about “who” you are working with. This is a revolutionary idea for our times: build your business based on your values. There's nothing small about that. This book is a treasure." 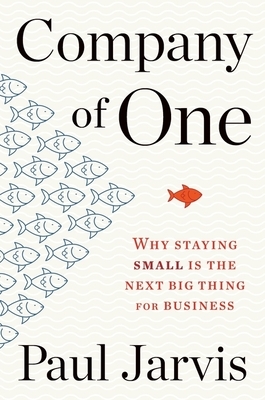 "Company of One will give you invaluable insights to focus on the purposeful, interesting, and impactful work you actually love doing, right alongside permission to stop blindly chasing growth by defining success on your own terms. This book is great for freelancers, side-hustlers, and small business owners who are looking to bring autonomy, self-reliance, and creativity to their work without becoming total workaholics.